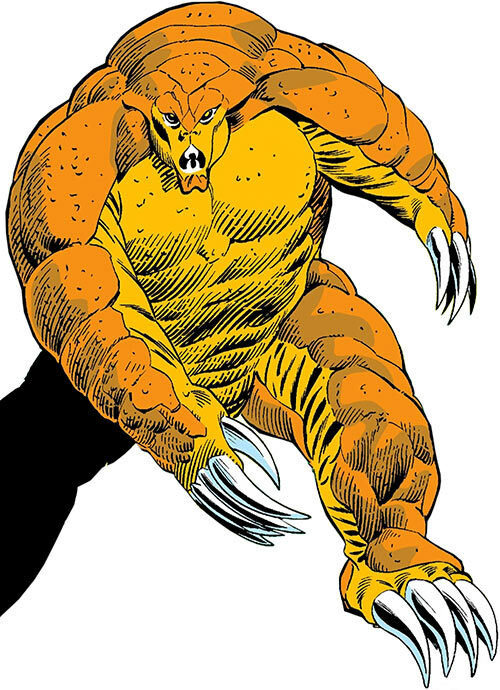 Armadillo is a Marvel Comics sort-of-but-not-really villain, who first appeared in 1985. He’s kept returning ever since with good regularity, though many of his appearances are just crowd scenes. He’s visually distinctive, has straightforward but fairly dangerous powers, and comes with some role-playing opportunities. So he’s handy to have. Other Aliases: Awesome Armadillo, Mr. A., ’dillo, Tony. Marital Status: Married (likely divorced now). Known Relatives: Bonita (wife) (likely ex-wife now). Group Affiliation: Former member of the Texas Rangers. Base Of Operations: The Vaults. Height: 7’6” Weight: 570 lbs. The Armadillo possesses superhuman strength, a high degree of resistance to bodily harm, and sharp claws on his hands and feet. The armour plating and tough hide covering his entire body enable him to withstand the force of ballistic weaponry up to light anti-tank weapons without penetration. His skin can withstand brief exposure to flame, ice, and acid without damage – though he likely is more vulnerable against lasers, blasters and the like. His bones and muscles have been augmented to such a degree that he can withstand the impact of being hit by a truck carrying ten tons of cargo traveling at 60 miles per hour without serious injury, or survive a fall from 350+ meters high on pavement, staying conscious but suffering from a concussion (and/or having cracked some bones). 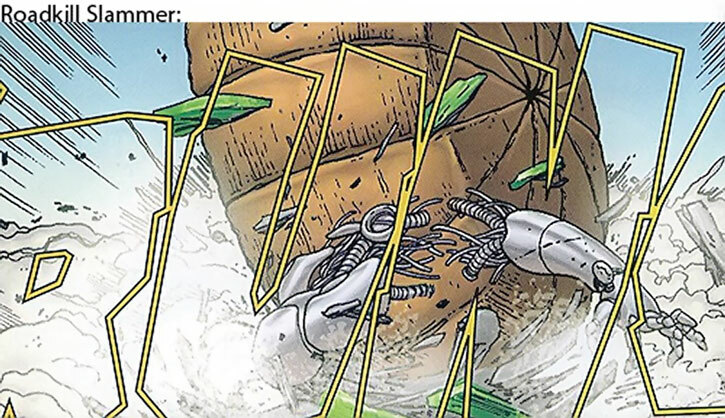 The Armadillo possesses superhuman endurance as well, enabling him to exert himself at peak capacity for over an hour before fatigue begins to impair his performance or to endure large quantities of knockout gas without much of an effect. Despite his mass, he can move as quickly as a normal-sized athletically inclined man. He also has trained as a wrestler. The Armadillo’s claws are strong enough to gouge cinderblock and medium-density steel with minimal wear on the nails. Between this and his great strength, Rodriguez can break through a standard 4 inch steel-reinforced cinderblock wall in a matter of seconds, or dig a hole in the earth deep enough to fit his entire body in less than a minute. When digging in most type of soil, he can somehow create a stable tunnel. While his claws are tough, they aren’t razor-sharp, and he can handle objects or touch normal persons without cutting them. The “Roadkill Slammer” is a special finisher the Armadillo developed prior to his Mexico wresting career. He rolls up into a ball like a real armadillo, and somehow propels himself at speed. 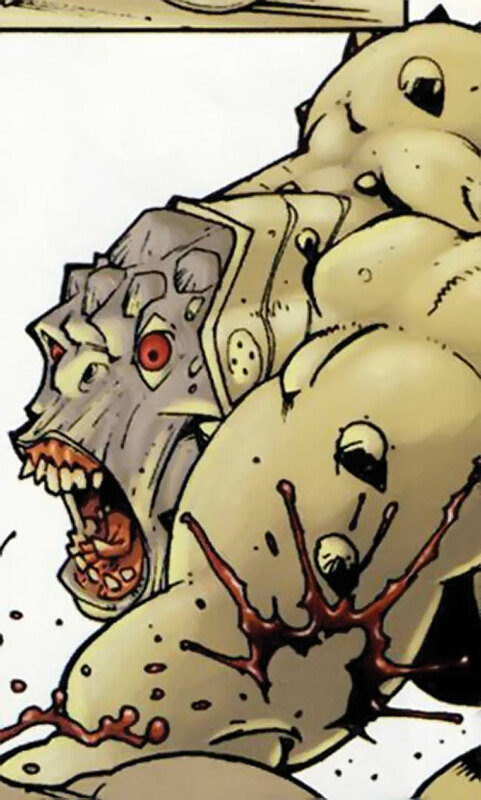 Since a sensor once misread the Armadillo as performing a Hulk-like jump, it it possible that the momentum for the Roadkill Slammer comes from Rodriguez lunging with massive superhuman strength, just like a gamma mutate can use their legs muscle to leap huge distances. Somehow, Rodriguez can sense where he’s going despite being balled up, for instance to roll around large obstacles or aim at a prone person to run them over. There’s no clue as to how he does it. Armadillo’s continuity gets pretty rocky during the 2000s. The episode detailed in the “Fade to grey” game stats section was not the only inconsistency, and it can be difficult for people who’d like to feature the Armadillo in a game or story to get a clear view of the character. 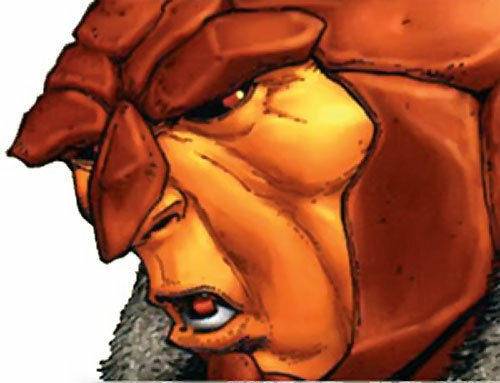 A fix was lobbed in by writer Dan Slott in 2007. 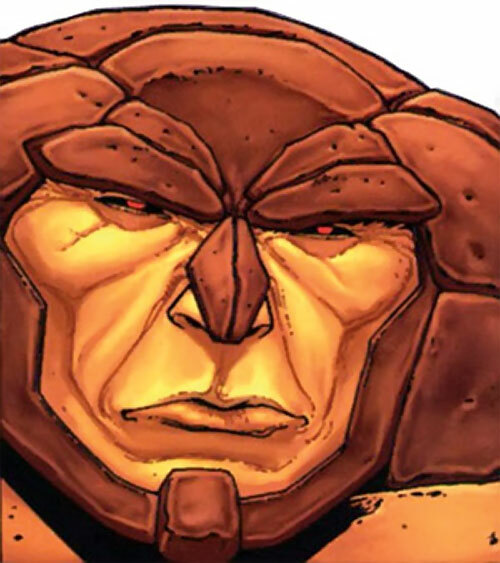 Slott revealed that Armadillo and other characters were occasionally impersonated by their equivalent from a parallel dimension , Earth-A, as part of an interdimensional tourism business. 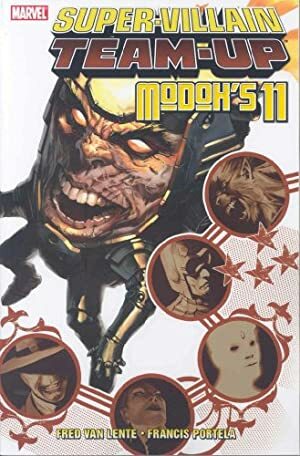 Those episodes that readers find puzzling from a continuity standpoint can thus be blamed on Earth-A Antonio Rodriguez impersonating Earth-616 Antonio Rodriguez. Presumably it was Earth-A Rodriguez who, in an unchronicled Earth-A story, got mutated into a grey form. 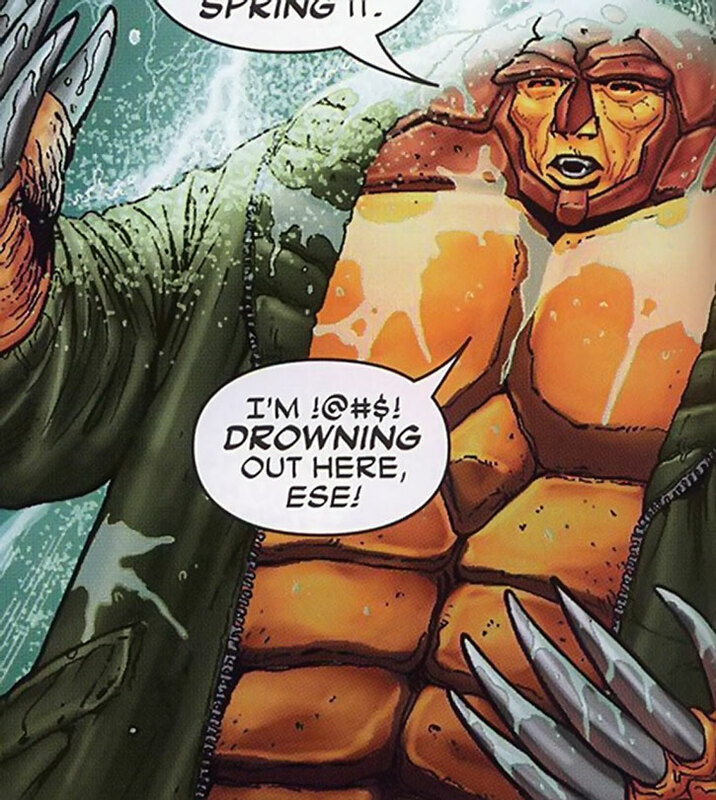 He then tried to impersonate his Earth-616 equivalent nevertheless, causing confusion on Earth-616. While he was in a Federal penitentiary Antonio Rodriguez’s wife Bonita caught a deadly, incurable disease. Finding her unconscious as he came back home from prison, he tried everything to help her until their meagre savings ran out. Desperate, Rodriguez reached the criminal physician doctor Malus through prison contacts. Malus told him that he could cure Bonita – at a cost. Antonio agreed to serve as an experimental subject for a new gene-splicing procedure devised by Malus, which turned him into a large creature looking a bit like a humanoid armadillo. To help finance the long experimental treatment that could save Bonita, Antonio worked as an agent for Malus. 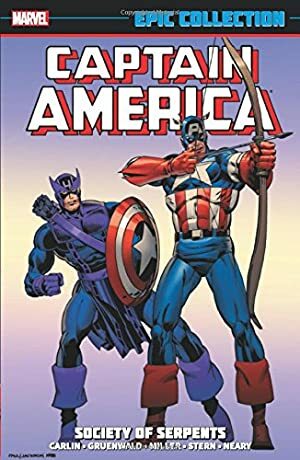 Rodriguez’s first mission was to invade the compound of the West Coast Avengers to retrieve the comatose body of a previous experimental subject of Malus, the giant Goliath. Though the WCAs were away, Antonio was defeated by Captain America and told him his story. Seeing that Rodriguez wasn’t malign, Cap let him go and shadowed him to find Malus. Captain America soon defeated Malus. However, Cap also negotiated with the authorities so Malus could continue to treat the comatose Bonita Rodriguez. Cap apparently also spoke in favour of Rodriguez and pointed out that he was acting under duress. Thanks to Captain America, no significant charges were pressed. Furthermore Malus succeeded in curing Bonita. Bonita convinced her husband to stay a superhuman rather than have the Avengers force Malus to revert him to his human state. Her plan was to have Antonio become a wrestler in the Unlimited Class Wrestling Federation and rake in the cash. Under the ring handle Armadillo (“Mister A.” to some fans), Mr. Rodriguez became a successful superhuman wrestler. The lucrative matches brought in far more money than the couple had ever earned before. The Rodriguezes started living in style and gained an entourage, the hangers-on of Armadillo’s manager Lennie Feitler. After winning a Madison Square Garden bout against fellow superstrong wrestler Doc Sawbones, Antonio accidentally discovered that the careless Bonita had been using him. She was having an affair with her hairdresser Ramon. Emotionally overwhelmed, Armadillo went on a rampage throughout Manhattan, walking to the Empire State Building so he could climb it then jump to his death. The NYPD and Captain America failed to stop him, as Rodriguez would throw cars to repel them. 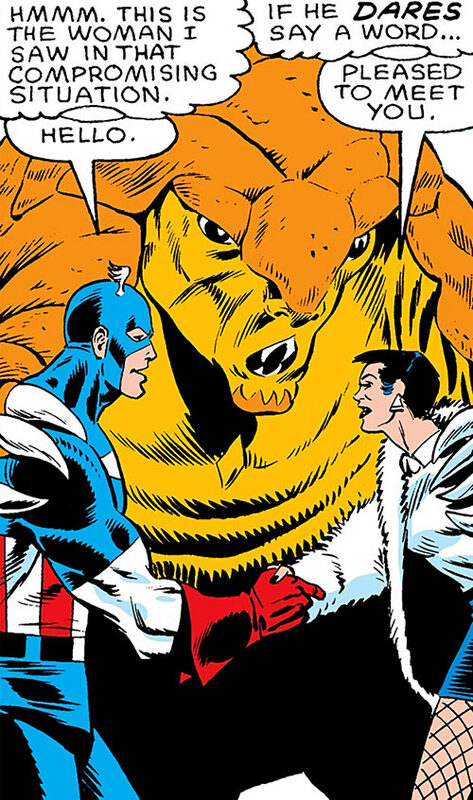 Cap nearly managed to talk Armadillo out of jumping, but was distracted. However, Rodriguez easily survived the fall, which didn’t even knock him unconscious. He surrendered and was imprisoned. Armadillo was imprisoned at the Vault super-prison. A breakout eventually occurred. Rodriguez decided to leave to go check on Bonita – and kill Ramon if they were still together. The guards had lost access to their heavy weaponry and were powerless to stop him. Rodriguez walked to the nearest road and commandeered a passing truck. The driver of the truck was the novice adventurer Vagabond, who talked him out of his murderous project and convinced him to surrender to the police. During subsequent breakouts, Armadillo decided not to join. The riot organised by the Wizard led to Rodriguez meeting the Rhino and the Scarecrow, who shared this outlook. Thus, when Venom triggered another breakout, the three men opposed him. Despite wanting to avoid trouble, Armadillo was twice teleported out and thrown into a fight. The first time he and other random villains were mind-controlled into attacking the She-Hulk. 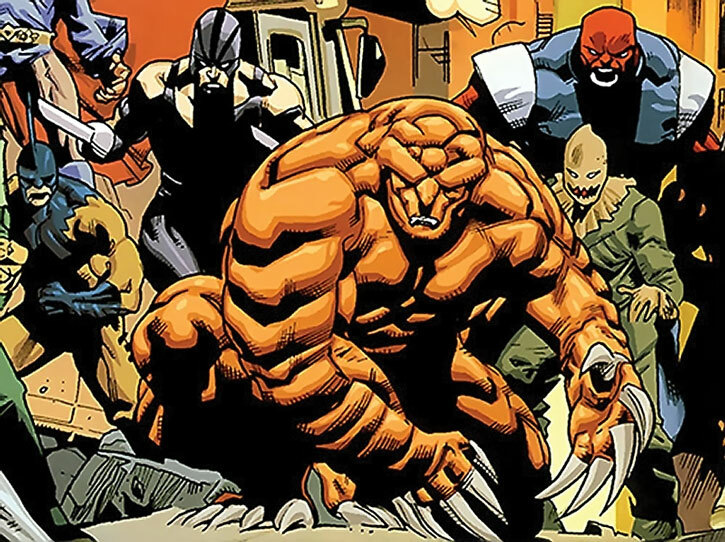 The second incident was quite similar, and Rodriguez and other mesmerised villains stormed the trial of the Fantastic Four. The attackers were like sleepwalkers and unaware of their actions. Armadillo was then roused into action – voluntarily, this time. One of his friends hung himself in his cell due to the manipulations of the ruthless killer Crossfire. 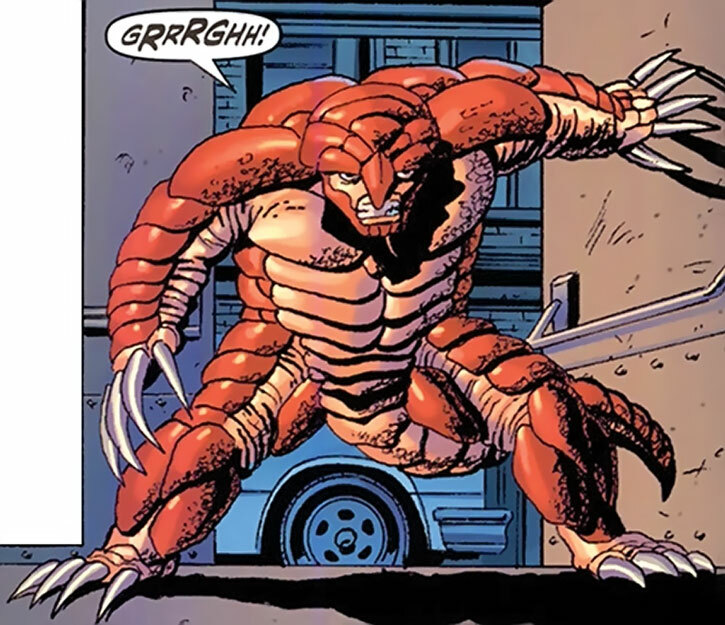 Rodriguez tried to kill Crossfire, but the assassin jammed a shiv into Armadillo’s power inhibitor, triggering anti-tampering devices that felled the depowered mutate. When yet another breakout occurred, Armadillo did leave the prison. I would assume that he was looking for Crossfire to avenge his dead buddy. But the breakout was sabotaged and stopped by the brand-new super-heroes, the Thunderbolts. Armadillo then may have gotten out and enlisted with the Ultimate Brawling League. Whether it actually was Earth-616 Antonio Rodriguez is unclear. See the “Fade to grey” boxed section in our game stats for more. Armadillo was spotted around super-villains bars, and landed a few mercenary jobs as muscle. He was once hired to accompany Constrictor and Jack O’Lantern, but the operation was foiled by Hercules. Constrictor was badly wounded in the fight, and would later successfully sue Hercules for a large amount. This defeat likely was the one that resulted in Rodriguez being sent to a new prison – the Raft. Though the Raft was more secure than even the Vault, a conspiracy allowed Electro to short out the entire prison and Armadillo may have escaped. He was later seen among a therapy group for super-villains, Vil-Anon, along with Equinox, Big Wheel and Man-Bull. When he appeared next, Armadillo escaped from the Vault, though he was chained to Tiger Shark. Forced to operate together, Armadillo and Tiger Shark went into hiding in a small town called Fairbury. They were tracked down some months later by the reality TV version of the New Warriors. During the fight Tiger Shark used the curled-up Armadillo at the end of the chain as a melee weapon, but despite the effectiveness of this trick the pair was narrowly defeated. Shortly after the Civil War, the Armadillo was registered as an authorised superhuman and joined the Texas team for the Fifty States Initiative – the Texas Rangers. He was the main addition to the Rangers’s classic roster – Red Wolf, Shooting Star, Phantom Rider, Texas Twister and Firebird. He may later have been kidnapped to join the demented menagerie of the second Kraven the Hunter (the son of the original), though this is unclear. Poor Antonio apparently fumbled the ball once more and was a washout with the Rangers. He mentioned that he had been betrayed, though what happened exactly remains unrevealed. He fled to Mexico to join the local version of the Unlimited Class Wrestling Federation, but the pay was far lower than on the US circuit. Rodriguez ended up having to work for a diminutive crime lord called Big Papi. 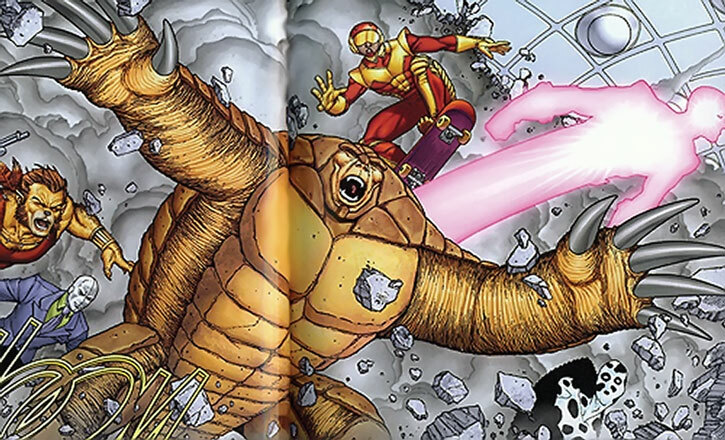 MODOK recruited Armadillo as part of his special team of supervillains. They were tasked with a difficult heist to steal a super-weapon. 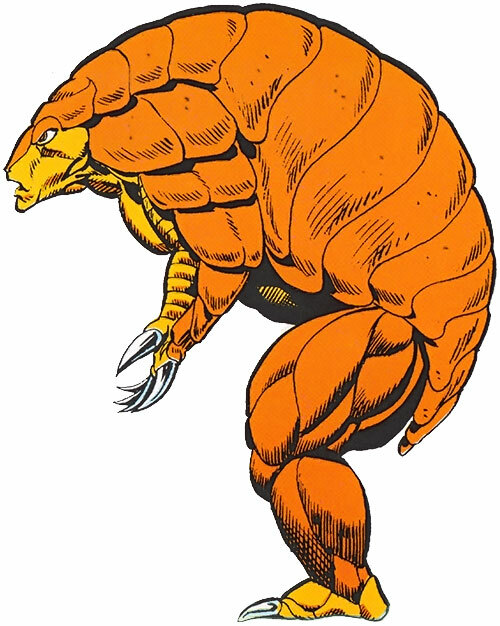 Armadillo was primarily recruited for his tunnelling abilities, so he could dig a way into the site holding the weapon and bypass much of the security. Armadillo was confused by the numerous treasons and twists that occurred during the job. He decided to just remain loyal to MODOK, as did Puma and Nightshade. This turned out to be the right choice for once, and Rodriguez received a hefty sum for his services. Armadillo was eventually captured and returned to the Raft. He escaped when the Skrulls’ secret invasion shorted out Stark technology planetwide. He returned to hide in the Southwestern United States, living on his own in the desert near a small village. One of the pueblo’s inhabitants saw on a web site that there was a bounty on Rodriguez. Though the rest of the pueblo wasn’t favourable to the idea he sold out the Armadillo, seeing how the money could benefit the very poor village. The web site was operated by wealthy individuals interested in hunting super-criminals. They came to hound the Armadillo. They weren’t very effective, but the clash attracted the attention of the Hulk. The Hulk’s sensors had somehow mistaken Rodriguez’s Roadkill Slammer trick for the leap of a gamma mutate. The situation was defused by She-Hulk (Jennifer Walters) who put an end to the violence, chased away the hunters, and negotiated with Rodriguez. She told Rodriguez to help the pueblo folks for a few months by digging wells and the like, and that when he’d surrender she’d be his pro bono defender and use his community service for the dirt-poor village in her pleading. Apparently, Walters’s legal strategy worked. By his next appearance Rodriguez wasn’t in prison. 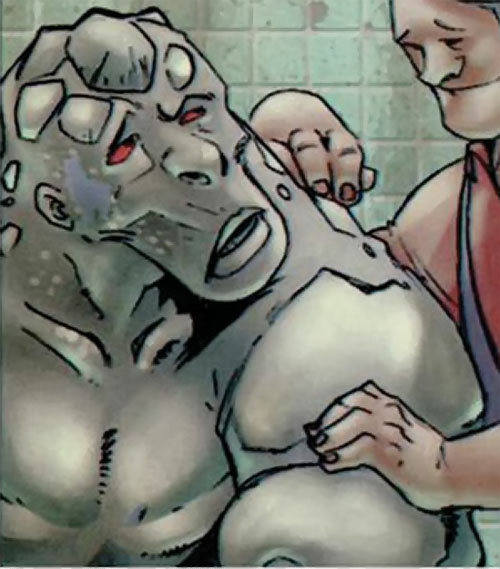 However, he was detained by another party — former Hydra agents wanting to test the Anathema designer toxin. The test was interrupted by vigilantes who provoked the Armadillo as a diversion, by using an image inducer to duplicate Rodriguez’s appearance. The Armadillo left during the subsequent chaos. Like many villains in his class, Armadillo was part of the scene that gravitated around the Hood during his reign as a crimelord. However it doesn’t seem that he did much beyond hanging around and enjoying the free beer. One secondary source states that he never actually worked for the Hood. And it is true that Rodriguez once joined a posse assembled by Jonas Harrow when the good doctor took over the Hood’s mob after his disappearance. The Hood’s extended entourage may have been the medium through which he was hired by the new man wearing the mask of the Rose, Dr. Hayes. 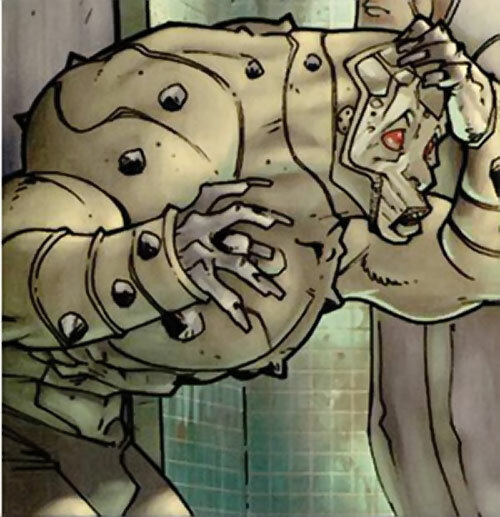 Armadillo was the Rose’s bodyguard, and when his employer was attacked by Spider-Man and Jackpot he briefly managed to repulse the both of them. Spider-Man eventually defeated Armadillo. Rodriguez and the Rose were arrested – though there presumably wasn’t much to charge the Armadillo with. Rodriguez looks a bit like an humanoid giant armadillo. 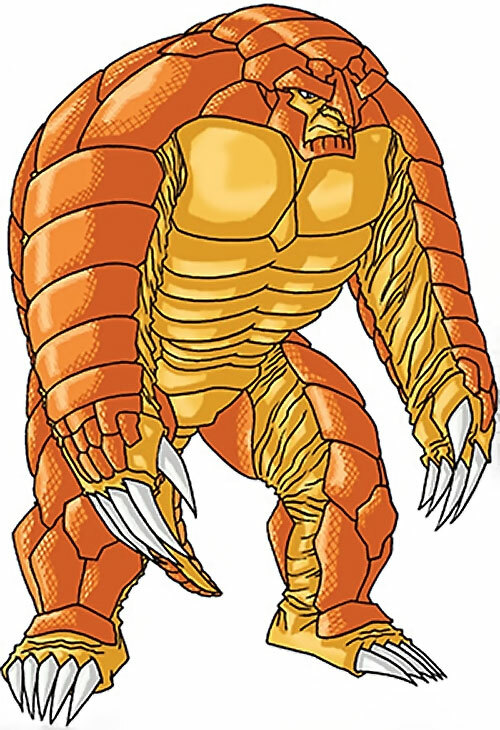 He’s covered with thick orange hide and six-inches thick armour plates, has a short tail, and sports large non-retractile claws on his hands and feet. The depiction of his face tends to vary from artist to artist. Antonio is not a bad person, but he’s far from being the sharpest tool in the shed. He’s very easy to convince and manipulate, and rather oblivious. While some would call him stupid, it’s more than he needs people he can trust. He will usually turn a blind eye toward lies since he’d rather follow somebody than be left alone. Another of his issues is that he can become quite violent when upset. He’s not very good at dealing with his own emotions and is liable to lash out in a dangerous manner. After the incident at the Empire State Building, Armadillo was condemned to a disproportionate sentence and started spending most of his time in prison. This led to developing ties with powerful prison gangs, and thus people who’d convince him to work with them since Rodriguez is not good at saying “no”. Having lived for a while in Mexico, Rodriguez now tends to use more Spanish in his speech out of habit. He seems even less aware than before (which may be because he’s getting punch-drunk), but warier when it comes to racist remarks against Hispanics. The Armadillo would have been created by Circe and used against Wonder Woman or the JLA, before being jailed in Belle Reve. He would have been used by the Suicide Squad when fighting the Manhunters. Running is a special case – see “Roadkill Slammer” below. Acrobatics (Climbing) is Contingent on Claws and only works when climbing material with a BODY one CS below his Claw APs (-2). Conditional Soaking (Blunt attacks and falls), Language (Spanish). Latino prison gangs (Low), Superpowered prison gangs (Low). Partial Attack Vulnerability (Focused energy attacks, -1CS RV), Partial Attack Vulnerability (Persuasion Character Interaction, -1CS RV), Oblivious, SPR (no articulated digits), Minor Rage, Strange Appearance, Uncertainty, Unluck, Misc. Attack Vulnerability (There is a weak spot in the armour plating on the Armadillo’s brow, with a RV of 04 against impaling attacks. Hitting it is done against a OV of 05, but the person must know precisely and from personal experience where the weak spot is. It doesn’t look different, it’s just much softer.). When digging long tunnels, Armadillo normally wears a miner’s light on his brow. I would imagine that he also carries a compass for those jobs. Being a human tank, the Armadillo prefers to conserve his HPs for LDD (especially when he can use his Conditional Soaking, and especially when he faces an opponent exploiting his low OV by doing Criticals, as Captain America did) though he might spend some to claw through a particularly tough obstacle. When he spends some HPs offensively (which he may do early in some fights) it will usually be on AV – he may be a bit dumb but he knows how to fight, even when he’s angry, and will spend his HPs wisely. The Roadkill Slammer is used in combat as a finisher — treat as a Charging attack with an EV of 13 (his normal EV using Claws, plus his Running speed). Note that on targets that just lay motionless on the ground, he can be treated for expediency’s sake as attempting a Critical against an OV of 00 – that’s the main use of the Slammer. Armadillo also uses this trick when he needs to travel quickly – especially if it’s downhill – as per normal Running. In one set of appearances, Armadillo behaves and looks different. There are substantial doubt as to whether it’s the same person, or another superhuman also calling himself Armadillo. This Armadillo looked greyer and even more monstrous (though he now had hands and had lost his claws), spoke differently, had different goals, etc. Based on the OHOTMU entry for Axum, the protagonist of these stories, these appearances are probably in continuity. A likely explanation is that they actually featured the Armadillo from a parallel Earth, Earth-A — see the “A and non-A” section in this profile. Our No-Prize Hypothesis developed before the Earth-A explanation was that Rodriguez used his savings to be mutated back to human form, which failed, leaving him with brain damage and a different form. Eventually, he reverted to his previous form and mentality as the Malus-spliced genetic material reasserted itself against the botched treatment. This may make sense if Malus genegineered Rodriguez with some sort of virus rewriting his entire DNA, at least in terms of comic book science. Partial Attack Vulnerability (Focused energy attacks, -1CS RV), Partial Attack Vulnerability (Persuasion Character Interaction, -1CS RV), Oblivious, Minor Rage, Strange Appearance, Uncertainty, Unluck, MPR (slurred elocution). During this phase of his life, Rodriguez is part of something called the Ultimate Brawling League, which organises bare-knuckles fights between superhumans – possibly illegally. He fought his way up to state championship for New Jersey. But his monstrous appearance and complete lack of charisma made him reviled by the fans, who were always cheering his opponents. Since he wasn’t popular despite his strong track record in the ring, the promoter of the UBL arranged for a former supervillain, Daniel Axum, to face him for the championship in a somewhat fixed fight. The hapless, reviled Armadillo was betrayed by his only friend, his ageing coach. ”Coach” deliberately botched the preparation for the fight. Sensing the betrayal, Armadillo fought like a maniac in the ring and nearly killed his opponent. Axum burned his Hero Points in desperation and managed to survive and defeat the champ. Armadillo was discarded and left to bleed away in the basement. But his tough physiology allowed him to survive the beating. He crawled away and lived as a homeless beggar just around the block to the gym where Axum was training. The Armadillo was day dreaming of the days when he was the champ, rummaging in garbage to find something to eat and unsuccessfully trying to talk with his old coach. Eventually Axum, feeling sorry for the poor wreck, befriended him and bought him dinner. The former New Jersey champ told his benefactor about the uselessness of revenge. As a result Axum decided not to join a team of supervillains seeking vengeance against Spider-Man. This likely spared him a new descent into criminality and the prison system. 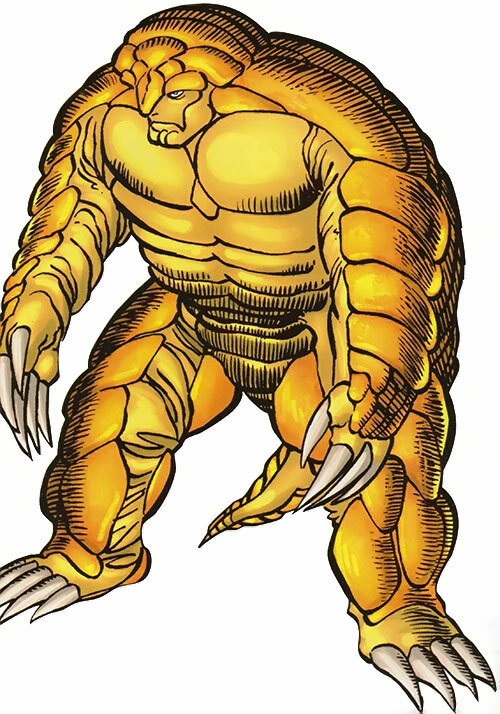 By his next appearance, Armadillo was back to his previous form (and colour), Wealth score and personality as if the entire thing had never happened. Helper(s): Marvel SAGA Roster Book, Gareth Lewis, Marvel.com . Writeup completed on the 23rd of April, 2011.